I have always adored mushrooms. Even as a young kid, believe it or not. Though back then, the only time I really ate them was on top of pizza. But now, as an adult, my affection for mushrooms have blossomed, and I have found many ways to incorporate them into a variety of Weight Watchers Recipes. One great dish I often make, is this super tasty Mushroom & Quinoa Sauté. It takes such minimal effort, but delivers such a delicious side dish. The earthy flavors of the mushrooms and quinoa are brightened by the garlic, onion, and thyme. One thing I like to do is to cook my quinoa in chicken broth instead of water, or add a bouillon cube to the cooking water for added flavor. And for just 5 Points, you get a filling and healthy side dish that tastes fantastic! 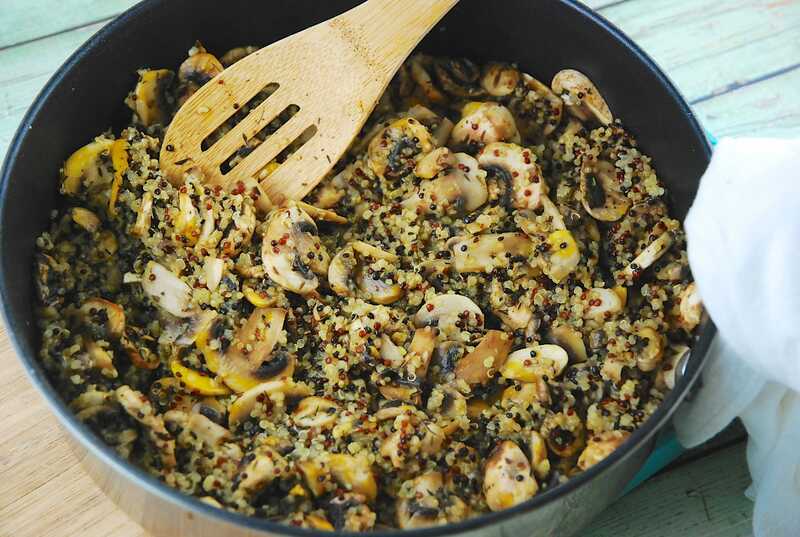 Hearty, earthy, and delicately flavored, this mushroom and quinoa dish is one of my favorite Weight Watchers side dish recipes. Simple to throw together, delicious to eat, and all the fiber and protein makes it a very filling side. Cook quinoa according to package instructions; set aside. Melt butter in a large skillet over medium high heat. Add in onion, garlic, mushrooms, and thyme and sauté until tender, about 5 minutes. Stir in cooked quinoa, and season with salt and pepper as desired. What light butter do you like/use? I’m so confused at the grocery with all the choices. The one I like the best is Brummel & Brown. It tastes great, has the perfect texture, and is very low in fat. i think brummel and brown is not really a butter…i use land o’ lakes light butter with canola and it tastes most like salted butter. i prefer sweet butter BUT that was before ww! Would love a “Pinterest” icon on each individual recipe on your blog! Thanks.